John McGuinness talking through his incredible outright record breaking lap from this year’s PokerStars Senior TT is just one of many highlights on the Isle of Man TT Races fuelled by Monster Energy stand at this year’s Motorcycle Live show at the NEC in Birmingham. John will be revealing all his tricks of the trade as he commentates live to stunning big screen on board footage and he’ll be joined by many of his Mountain Course rivals, who will no doubt be listening intently as they plot to dethrone the Morecambe Missile. Others lined up to talk through their laps include Michael Dunlop and James Hillier the latter man explaining what was going through his mind on his Kawasaki H2R parade lap from earlier in the year. And if you ever wondered what it feels like to race a sidecar around the 37¾ mile course, you’ll get the chance to get up close and personal with the Birchall brothers as they talk through one of their TT laps. Many of the TT and Classic TT winning bikes will be on the stand including John McGuinnesses’ trusty Honda Fireblade that fired him to victory in the unforgettable PokerStars Senior TT, not to mention the Valvoline by Padgetts Racing Honda that Bruce Anstey rode for his first, hugely emotional, ‘big bike’ TT Mountain Course win in the RST Superbike Race. No less emotional will be an appearance by Ian Hutchinson who will be reunited with the double Monster Energy Supersport Race winning Team Traction Control Yamaha while nostalgia fans can enjoy the Classic TT race winning Team Classic Suzuki and Black Eagle Racing MV Agusta that Michael Dunlop and Dean Harrison raced to victory in the Motorsport Merchandise Formula 1 and Bennetts 500cc Races respectively. 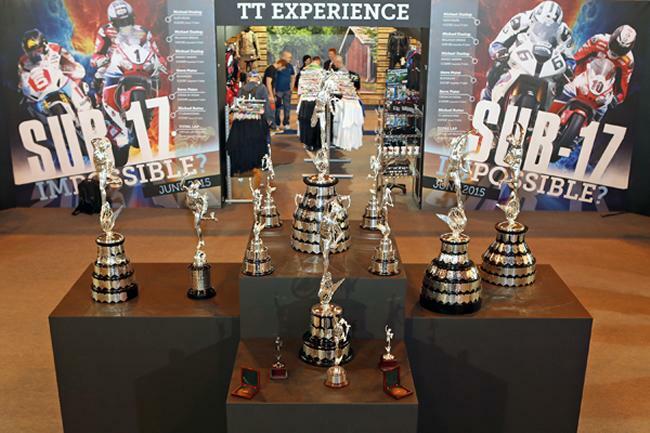 And as well as the race winning-bikes, you can also see, and be pictured with, the glittering collection of every race winning trophy from this year’s TT Races including the iconic and priceless winged Mercury Senior TT Trophy, one of the most instantly recognisable trophies in world sport. The Isle of Man will be taking centre stage at the NEC in the now traditional Classic TT Day on Sunday 29th of November, with many of the leading names from this year’s nostalgia fest appearing in chat shows with ITV4 commentators James Whitham and Steve Parrish and signing sessions throughout the day while the 2015 Motorcycle Live show will finish on its now traditional high with ‘Mad TT Sunday’ on 6th December with the TT stars reliving their best moments from this year’s memorable TT meeting. The Isle of Man TT will be on stand 4e10 in Hall 4 for this year’s Motorcycle Live show, which runs from Saturday 28th November to Sunday 6th December.